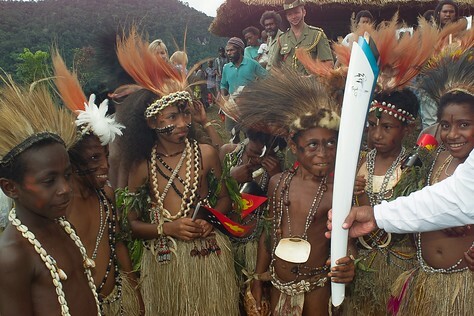 Day 6 in PNG was perhaps my best day as a Torch Relay photographer. Rich in tribal colour. And the camera behaved itself for most of the day. Some of my favourite images of the whole relay are from this day. The main event of the day took place at Owers Corner on the Kokoda Trail. As any Australian will know, the 96km Kokoda Trail is a legendary story about Aussie soldiers fighting the Japanese in WW2. It is accessible only by foot and takes at least 4 days to walk. 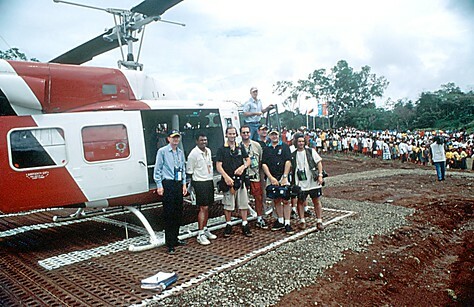 We had less than a day – so we were choppered in from Port Moresby on two helicopters. 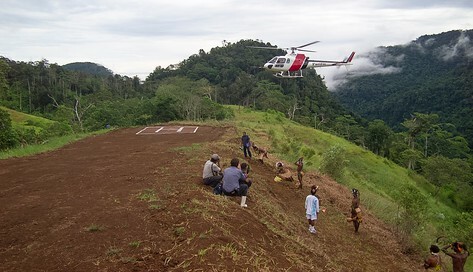 What we weren’t told until after we left was that the local tribe had threatened to shoot our choppers down in protest to the way government funds were being spent! 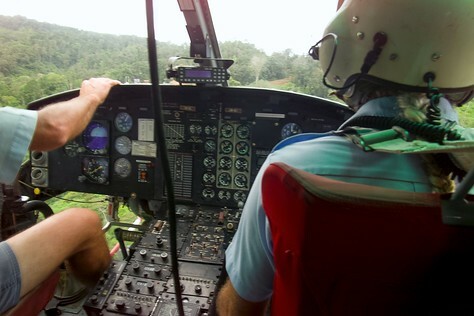 Our safety briefing by the pilot was very short “If we go down in the jungle, we use this…” and he pulled out a rusty old machete from bedside his controls. 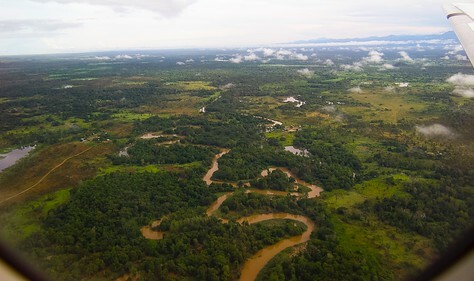 It seemed our only way of survival was to hack our way through the jungle and back to civilisation! Landing at Owers Corner via chopper felt special. Everyone else had sweated and cursed for days to get there. We got there in 30 minutes. Greeting us were the last 6 remaining ‘Fuzzy Wuzzy Angels’. The Fuzzys, as they were affectionally nicknamed by the Anzac soldiers (based on their big, frizzy hair and the angel-like way they carried the men to safety), were local tribesmen who, during the war, became volunteer stretcher bearers for sick and dying soldiers. They would carry the soldiers on makeshift slings for days, through the dense jungles to reach medical care. It brought tears to all of us just to stand beside these brave and humble men. 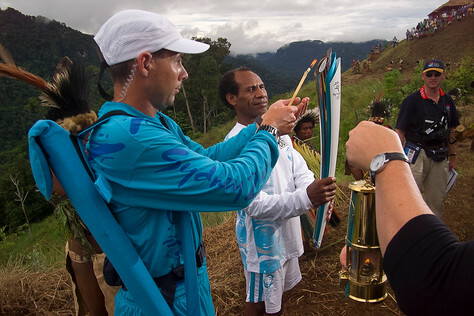 Photographically one of my favourite ‘behind the scenes’ photo is this one – showing the Torch being light by the Flame Security officer Glen (a policeman in day-to-day life). 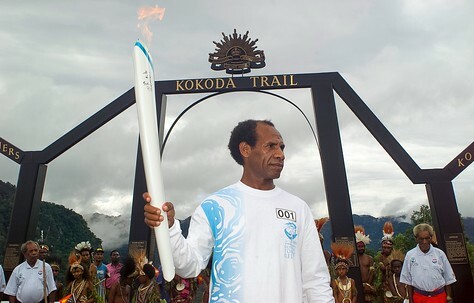 On his back is a sling containing another Torch (useful if venturing away too far from the miners lanterns – as each torch has only 8 to 12 minutes worth of gas), the safety lantern itself is in the middle of of the shot with the flame, the torchbearer with his torch (in this case Garry Imri – Chairman of the Koiari Development Authority – the Koiari tribe own the traditional lands). On the right in the crew uniform is the chief of the Torch Relay crew, Barry ‘BG’ Gallagher. His call sign is ‘Command’. And it is his voice that directs the entire operation. He keeps the whole event on time and makes all the vital day to day decisions. A group photo before taking the chopper up to Owers Corner - even the pilot thought it a good idea to get in on this one - A last photo before we all go down?